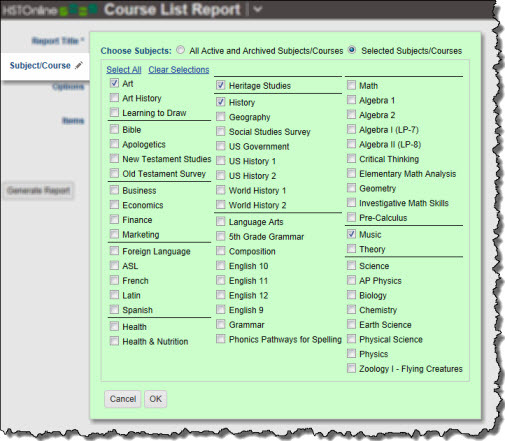 The Course List report provides a way to print out details about each Course in your database. You can choose which Courses to include in the report, and which details of the Courses are displayed. You might choose to include this report in a portfolio or as an adjunct to the Transcript. The Course field must be enabled in order to utilize this report. The name of the Subject to which the Course is tied (red arrow). The name of the Course (purple arrow). The number of Credit Units assigned to the Course (black circle). The Course Description (blue squiggle). The Grading Scale attached to the Course. The Grading Scale shows the letter grade, the minimum percentage required to attain that letter grade, and the quality points assigned to that letter grade. If the Course is using Weighted Grading, each Weighted Activity and its assigned weight will be displayed (green squiggle). The name of each Resource tied to the Subject/Course in the Library (orange squiggle). The default name for this report is: Course List. You can change the Report Title to anything you like, up to 150 characters. Click or touch the Subject/Course field name or the pencil icon to choose the Courses want to run the report for. If you select Subject, all the Courses for that Subject will be included in the report. If the selected Subject has no related Courses, the Subject will be excluded from the report. The Subject/Course option window includes all Active and Archived Subjects and Courses for selection. 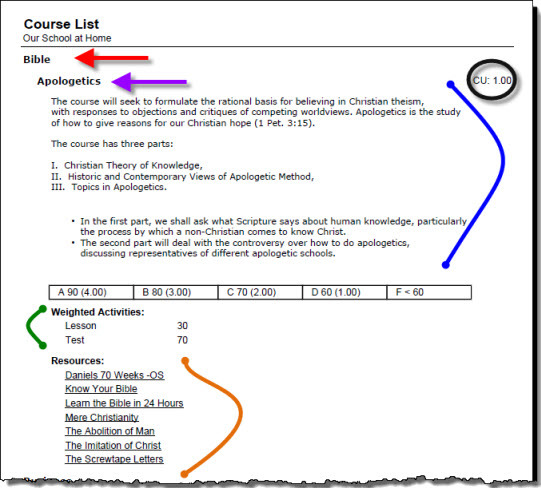 New Page for Each Course: Check this box to have HSTOnline start a new page in the report for each Course displayed. 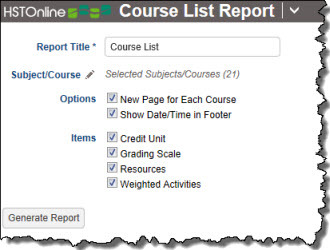 Show Date/Time in Footer: Choose whether to display the date and time when the Course List report was generated. The date and time will be determined based on your Time Zone settings. Credit Unit: Displays the Credit Units assigned to the Course. Grading Scale: Displays the Grading Scale assigned to the Course showing the letter grade, minimum percentage required for that grade, and the quality points assigned to the letter grade. Resources: Displays the items from your Library which are marked as Resources for the Subject/Course being displayed. Weighted Activities: If you select this option the report will display each weighted Activity and the weight assigned to it, for any Course in your list using Weighted Grading. On the HSTOnline menu, click or touch 'Course List' under the 'Reports' section.